Five-year-old Mia stood at the gate to the playground. She wanted to see her friend, but couldn’t open the gate. Mia could have used any number of adjectives for Gemma. Having blonde hair is just one, others would include tall, fast, sharp, talkative, blue-eyed, caring, determined, vivacious (perhaps a stretch for a five-year-old to use! ), a climber, playful, inventive, imaginative, skilful, dexterous (maybe, see ‘vivacious’) or wilful. And this sums up Gemma’s interactions with her friends. They see a tall five-year-old girl with blue eyes and blonde hair, who likes to have fun playing games, running around and using her imagination. Gemma responds in kind. She loves playing with her friends, but is also able to entertain herself for hours with her toys or drawing or making things with whatever’s lying around. Her determination is legendary at her daycare centre. Nothing fazes Gemma, and she will stick at a task until it is done, only sometimes asking for help. You can offer to help Gemma, but never presume to give it until it is asked for! In the playground, with other children who don’t know her, Gemma can be an object of fascination. Some children take one look, and ignore. Others know there’s something different and don’t know why – they’re inquisitive and just want an answer. A few aren’t satisfied with that and hang around long enough for their parents to realise they’re now in the way. Gemma will provide her one answer to the obvious question, “I was born like it,” and then carry on playing. In the playground, Gemma likes everything – swings, slides, climbing walls, up and down ladders and stairs, running around, in the cubby house. 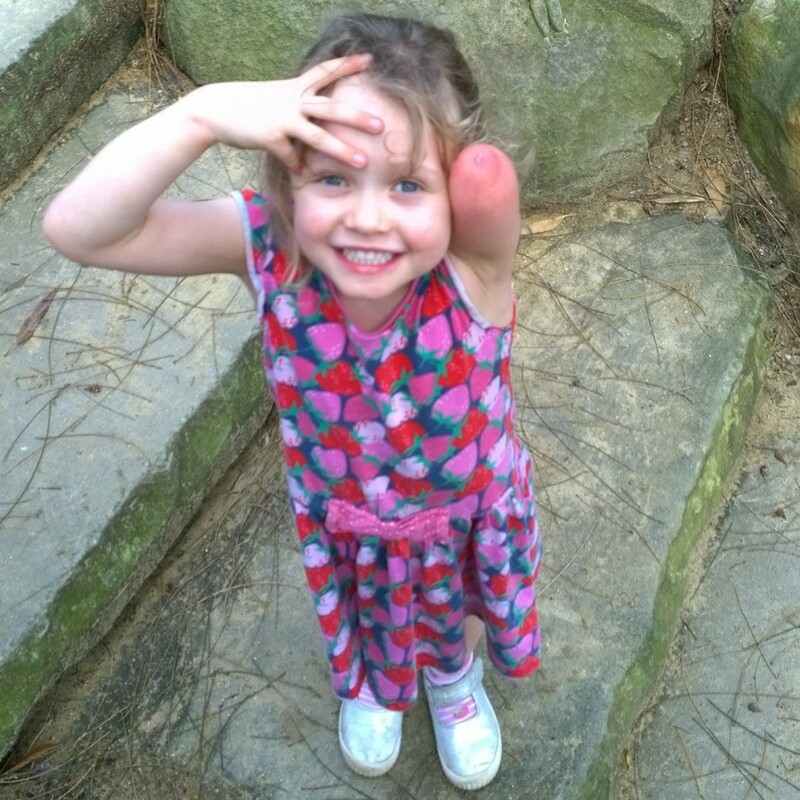 Parents will sometimes offer to help Gemma as they see a child who isn’t as able-bodied as their own. Gemma will probably tell them she doesn’t need it, and finish scaling the climbing wall up to the top of the slide before disappearing down it, and off somewhere else. The parent might then come up to us and comment on how wonderfully able and polite Gemma is, as she would have declined the help with a “No, thanks.” They might even satisfy their own curiosity and ask what happened. They get the same answer that Gemma gave, “She was born like it,” before we’re tugged in opposite directions to watch over our respective children. Gemma goes to school in 2016. Many of the children at her local school already know her as Zoe’s little sister. They know about Gemma and what she can do, and don’t bother either getting in the way or offering to help – they know Gemma will ask. Many there, though, don’t know Gemma, so she will go through the whole routine of meeting new people and their reactions many more times in the coming couple of years. It does seem of interest to children aged 5 to 7. Younger than that, and they just don’t notice. Older than that and they notice, but either don’t want to pry, or don’t really care. There will be more parents that won’t be sure what Gemma can or can’t do and whether she can be invited to a particular birthday activity – Gemma will tell them, and we’ll leave it up to her to decide. We’ll help those parents, and teachers, who aren’t sure what to say or do, and we’ll make sure that Gemma gets to do what she wants. Within reason, just like any other five-year-old child.